The Great Kitchen Project continues! 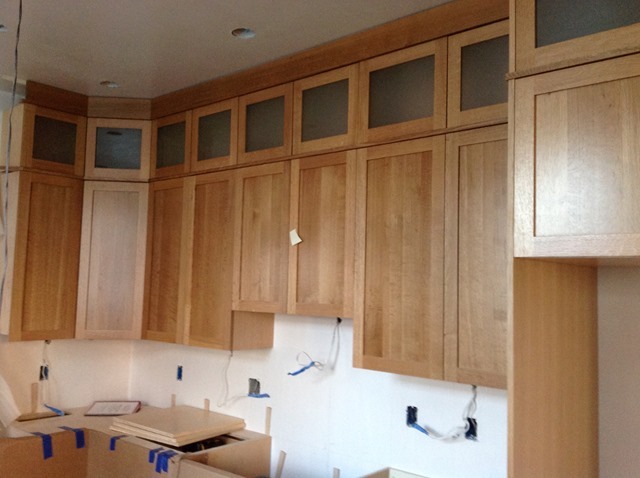 More cabinets were delivered and have been installed. Here you see the waay-up cabinets. Sitting between the top of the standard height cabinets and the 9-foot ceiling, they are too high for access without a stepstool, but they will come in handy for storing those once-a-year things, like cookie tins, the Thanksgiving platter, and the like. We opted for frosted glass fronts on them instead of the solid wood panel in order to lighten up the look, but still hide whatever is inside. The arrival and beginning of the install on this set is our step forward. Our step back is that our trusty master carpenter, on close inspection of some of the units put in by his team earlier in the week, noticed some flaws in the finish of some of the framing units and some of the doors. He removed the suspect pieces and sent them back for more attention. The delay isn’t great, but I am grateful that he knows what to look for, and cares about quality. You can see cardboard protectors taped onto the front of the lower units, in place of the missing doors. No work today because of the cabinet return delay, and the crew needing to finish up another job for the same general contractor, but next week should see the re-install of the missing units, and the rest of the top level; finishing off the small crown molding on top (you can see the “behind” layer that will support it just above the top cabinets); and an attack made on the wood trim around the windows and doors. Finally, in other news, the appliances have been delivered (but are still packed); and stone for the countertops will be chosen today. And drawer/cabinet pull hardware has been ordered. Stay tuned! I love seeing your progress. This is exciting to watch unfold. You are so lucky to have a tradesman who cares about the quality of the work. Those high cupboards – another good reason to have them is that without filling that gap you’d have an awful unreachable dust trap on top of the standard-height cupboards! It’s looking great. How exciting to see things coming together! I love the frosted glass on the way-up-high cupboards. It’s elegant and practical too. This is so much fun to watch your kitchen become a beautiful and useful space – especially since I’m far away and not subject to any of the noise or dust! Did you put lights behind the top cabinets? Just curious. No we did not. We’ve Seen done and the result makes any clutter up there all too evident. We left them un illuminated and no not regret that choice.